Shrews look a little bit like rats, but don’t be fooled. These small mammals aren’t even closely related to rats. Instead, shrews are more closely related to moles. They have a long, narrow body, a small head and a pointed snout. Shrews are more closely related to moles. They have a long, narrow body, a small head and a pointed snout. Read on for more all about shrews. Like moles, shrews love to eat insects. They also eat small mice and lizards. 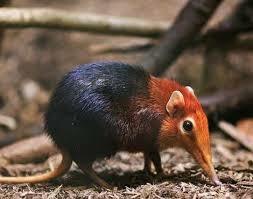 There are over 250 species of shrews, living almost everywhere in the world except Australia. Most shrews are small animals. The smallest shrew, the pygmy shrew is only as long as your finger. 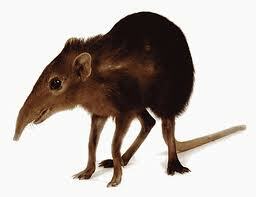 The African giant shrew is about 9 inches long. Like moles, shrews love to eat insects. Some shrews are aquatic and live in or near the water. Their feet have hairs that trap bubbles. These shrews can glide across the water. Some shrews have poisonous saliva, which paralyzes their prey. Shrews live in moist, wet places like forests, woodlands or near ponds. They hide in caves, burrows or under old logs. Shrews are hyper. They go all the time, looking for things to eat. Shrews can have as many as four litters of babies in a year. Each litter can have up to 10 babies. That’s 40 babies in one year! 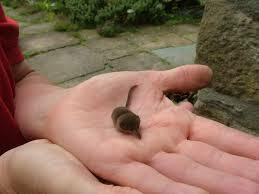 The smallest shrew, the pygmy shrew is only as long as your finger. 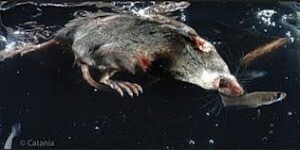 Some shrews are aquatic and live in or near the water. Their feet have hairs that trap bubbles. A video about a shrew eating a snake. Question: How long do shrews live? Answer: Only about two years. They are eaten by larger animals or die from disease. Question: How often do shrews eat? Answer: Shrews are so energetic, that they must eat almost all day long. They will starve to death if they don’t eat at least every three hours. Enjoyed the Easy Science for Kids Website all about Shrews info? Take the FREE & fun Shrews quiz and download FREE Shrews worksheet for kids. For lengthy info click here. Declan, Tobin. " Shrews Facts for Kids ." Easy Science for Kids, Apr 2019. Web. 20 Apr 2019. < https://easyscienceforkids.com/all-about-shrews/ >.